You easily login to our user-friendly interface with your web browser. In the user interface, you will immediately see your subscribed sections. Your railway is divided into sections. A section is automatically processed from GPS data and 3D ADR (advanced dead reckoning), collected by our system. All measurements will be pinpointed to specific positions on a section. A section is then divided into sub-sections of 10-25 meters. These sub-sections can be named to fit you and your geographical information system. Algorithms are created continuously to find defects in the infrastructure. Alarms are pinpointed to a geographical position with the accuracy of less than 2 meters. Triggered alarms can be monitored for possible development toward higher levels. A repair is easily followed up as feedback in the portal by new measurements from the same position. Using cross-reference of algorithms and sensor behavior between customers, a railway owner in Europe can benefit from the constantly evolving algorithms even if the data is originally used in India or the US. Trigger levels or thresholds can be modified for each customer. 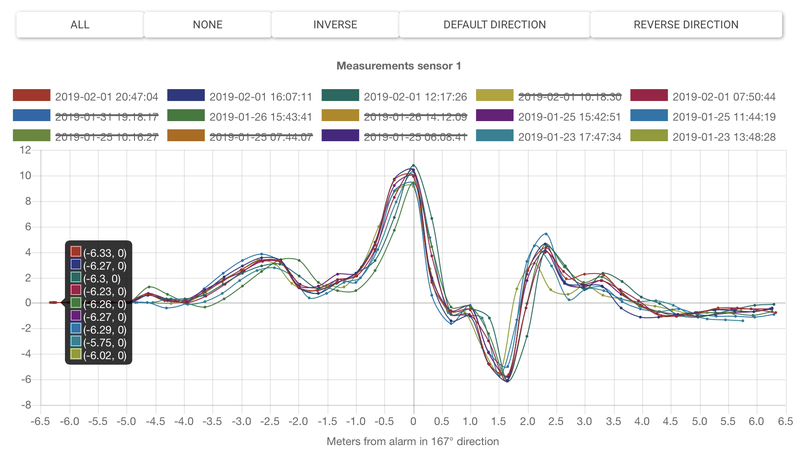 All measured deviation of the same alarm is shown with individual information and unique positions. This also makes it possible to narrow the position down to almost zero meter in accuracy. All individual measurement, each passing of the position of the alarm, will be shown in graph. The repeatability is clearly shown to demonstrate that there is no doubt about probability of each alarm. All equipped trains are shown online with position and complete system information. All systems are monitored with regard to functionality, calibration (which is done automatically), maintenance need (battery charging) and any alarms triggered (i.e. “moved sensors”, when maintenance on the train has forced the need to move the sensors). 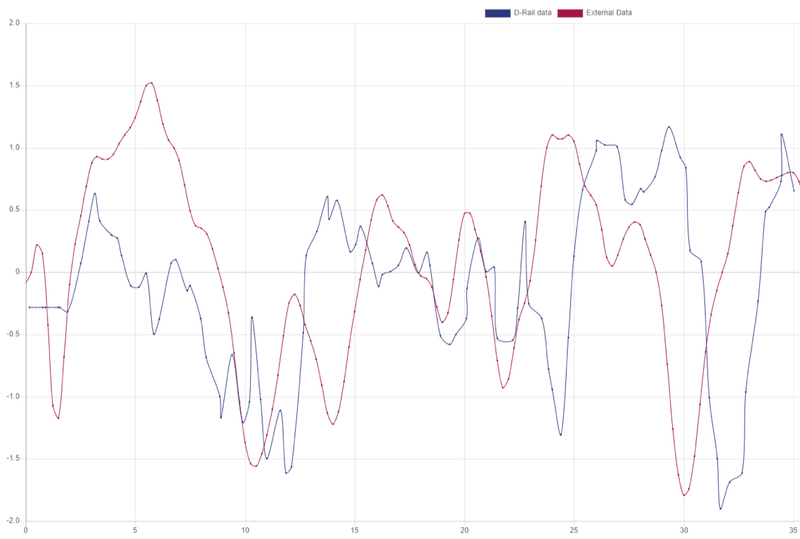 Data comparison between the IMV200 measurement train and D-RAIL sensor data. Rail height left side. Left scale is in millimeters and the comparison is from the same start point and 30 meters ahead. Observe that it is 3 months between measurement dates. 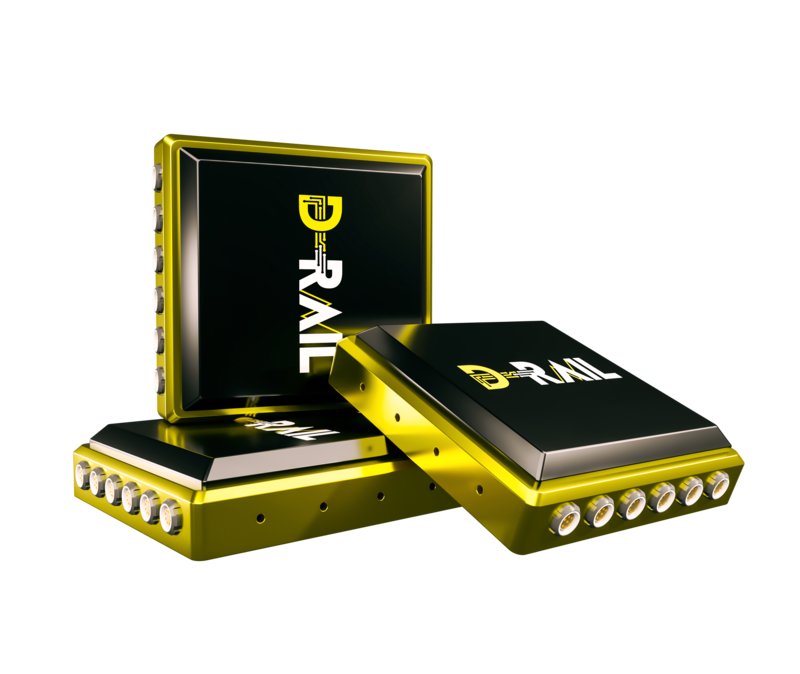 Our sensors are developed with cutting edge technology to be completely train independent and non-intrusive. 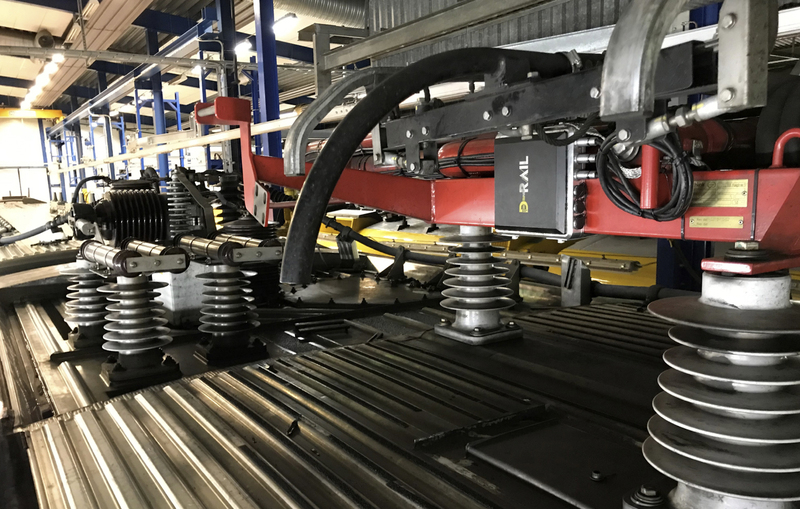 The design enables minimum maintenance and top performance, while they are quickly and easily installed to measure the relative status of tracks, track bed, catenary and signal system. The sensors are completely autonomous with a battery life of 2,5 years in full operation, without energy harvesting. With an energy harvesting circuit (magnetic field harvesting), the battery lifetime can be extended to infinity. Without energy harvesting, the sensor is charged on the train inside the depot and will be fully charged within 1 hour. 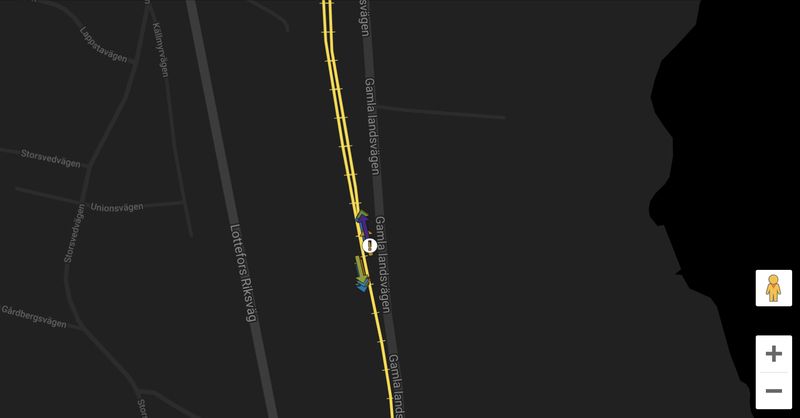 1 gateway and 2 sensors per train is enough for the system to harvest spot-on big data. It only takes one or two hours for us to make a complete installation on any train. Train specific documentations prior to installation is produced together with train operator/ train owner and signed by necessary parts. The system is CSM-RA considered to be a non-significant change and 100% reversible. 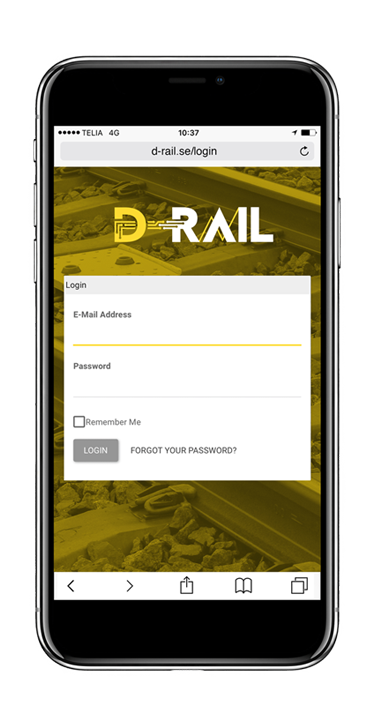 The system is owned and insured by D-Rail.